If you are self-employed or work on contract you may feel the pinch a little more astutely, and you may be uneasy when income is lower than usual. This information will give you a rough idea of your financial situation, and will make any future decisions you make much easier. So what do you do now? Well, if you can weather the storm, then perhaps your best bet may be to leave everything untouched. Don’t worry unless you absolutely have to; sometimes the most prudent financial move you can make is the one you don’t make at all. But sometimes the numbers just don’t add up in your favour. Your debts may be cumbersome and unwieldy, or perhaps you may need to add some liquidity to your finances; in which case you will need to know your options. One common option is a second mortgage, but their use can elicit rates as high as 19 per cent. This kind of rate is too high for most people, and is in most cases entirely unnecessary. Alternately, a mortgage refinance will allow you to use the equity in your home or property, to free that extra cash without the large repayment plan attached to most personal loans or lines of credit. You can use a debt consolidation service (a form of refinance) to gather all of your debts into one place. Now instead of paying a handful of bills at exorbitant credit card interest rates, you could take advantage of today’s historic low mortgage rates. 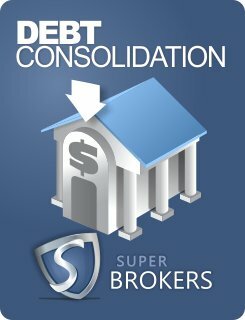 In the end the decision is yours, but a debt consolidation or a mortgage refinance can cost effectively remove debt and can make the financing of your future projects that much easier. This entry was posted in Residential Mortgages and tagged credit, credit card, debt, debt consolidation, equity, financial planning, mortgage, mortgage rates, refinance, saving money by The Super Broker. Bookmark the permalink.